This study Bible has a large number of features that will enhance you Bible time. Each page has many features that will help you understand God's Word. The grey shaded area at the bottom of the pages are Doctrinal Footnotes – a total survey of the doctrines of the Bible, and/or Personality Profiles – brief biographies of key men and women placed near the verse where they are mentioned, and/or Archaeological Sites – archaeology fines of significance places mentioned in the Bible. Hundreds of full-color photos and illustrations and 57 full color maps through-out the text and at the end. Center column references, special interest articles, indexes of footnotes, profiles and archaeological sites. Topical index of Christ and the Gospels. A special section on How to use the KJV Study Bible describes the symbols used to designate the type of footnote. The center column gives references and equivalent translation, literal translation, explanatory notes, language notes and alternate translations. To help in studying there are subject headings, Jesus’s words in red letter type and italic type to indicate words that contained in the original text but are needed for English clarity. 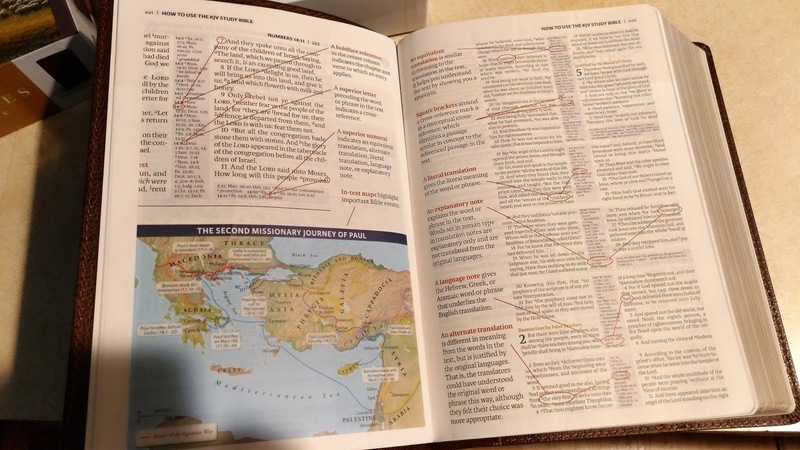 Notes on how to study the Bible are included, as is a list of God’s answers to our concerns that include Bible verse references. The time-honored King James Version that most everyone is familiar with. The copy I received to review was covered in brown bonded leather, large print and will lay flat. A great addition to anyone’s library. 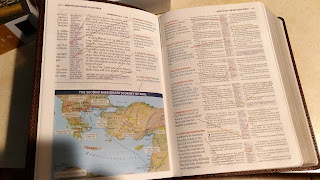 Even if your favorite translation is not the KJV I think you will enjoy using this study Bible with the beautiful photos, illustrations, collection of study notes and helps that makes this a copy of the Bible you will like.